In a parallel project funded by the New Hampshire Department of Transportation (Evaluation of Gusset-less Truss Connection to Aid Bridge Inspection and Condition Assessment), two scaled sections of a typical lower-chord gusset-less connection will be tested for fatigue loading at the UNH Structural Engineering Laboratory. The test setup in its current state, is shown below in Figure 1. 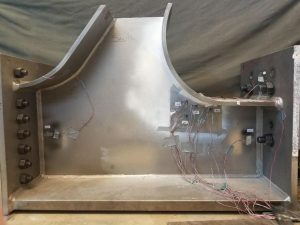 The purpose of these tests is to evaluate the fatigue performance of intact welds as well as welds with defects located along the bend radius of the connection. The connection specimen, shown below in Figure 2, is being exposed to cyclic loading ranging from 5,000 lbs to 105,000 lbs at a frequency of 3.5 Hz. This loading protocol is more severe than what the actual bridge connection experiences under heavy traffic. 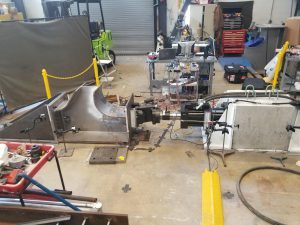 Since the weld is designed to have “infinite fatigue life,” the in-tact weld is not expected to fail. After one million cycles, if this is the case, it is planned to introduce damage to the weld to simulate a defect. The test will then continue until failure has occurred.